I seem to remember wanting a pair of Lois heels from Schuh, but don't think they went up to a size 9. Also like the boots in your photo. They didn't go up to a 9, if they did I would have bought those instead. I can get the 8's on, but they just aren't a walking shoe in any sense of the word..... Lovely feel to wearing them though! If I remember, you are into strappy sandal styles? The one I pictured above go to size 8, but might well fit like a 9? Could be worth a look as they are only £12, and are surprisingly high for the money. I would like to try them on. Will have to see when is convienient to us both. Thank you for the nice comment on my boots. They were the first of boots I bought. Next time I,m in Portsmouth I will have a look at those sandals. I do have wide feet, so those might fit me well. Can you measure the shoe box please at the widest part..Having a rethink at the moment on what heels to buy and trying to find a way to buy more comfortable heels with out having to try them on first. I seem to be buying more and more heels on Ebay now. Just seen this pair on Ebay. Never bought any heels from Zara before so don't know if these will fit me. Also the double straps could be a problem as well. We could do with another thread on here about sizing between shoe shops. Aldo seem to run small. I also have a pair from Topshop and Ninewest which are to small / narrow Well the Ninewest I bought last month are too narrow but are marked up as 11w. Can you measure the shoe box please at the widest part..Having a rethink at the moment on what heels to buy and trying to find a way to buy more comfortable heels with out having to try them on first. I seem to be buying more and more heels on Ebay now. Sorry, returned the Primarmi sandals last week. More bad news ..... Zara run small. I can just about get in their 8's, and I've got narrow-ish feet. Topshop run small, but I've always found Nine West to run large/wide. Even a 10W has my foot flopping around inside the toe box. ALDO tend to run a bit large on some, and spot on with most. They do a 9½ in some styles too. Just bought these 2 pairs and now up to date with heels I need to post up on here. Pair on the left are Topshop. Might have to sell them on again as too small but only paid £8 + P&P so not a much of a problem. Only bought them as they were cheap. The pair on the right are Next. Didn't pay much more for these either but do fit and are fairly comfortable. Noticed both pairs are Black / Gold. Was that an echo I heard? Don't know if anyone else has noticed or stumbled across them, but one half of what used to be The Little Shoe Box (aka Covergirl shoes) has some shoes and boots on the auction site for very very reasonable money. Styles with stupidly high heels from UK size 8 -ish to a 10½ possibly. I've been watching another pair from this seller, but not buying. Bought this pair last week. Paid little more then I wanted to but very pleased with them. There were also another two pairs that look almost the same.and I did bid on one pair. First pair were multi colour with a little platform but the p&p was over £10 and the listing ended with out any one buying them. 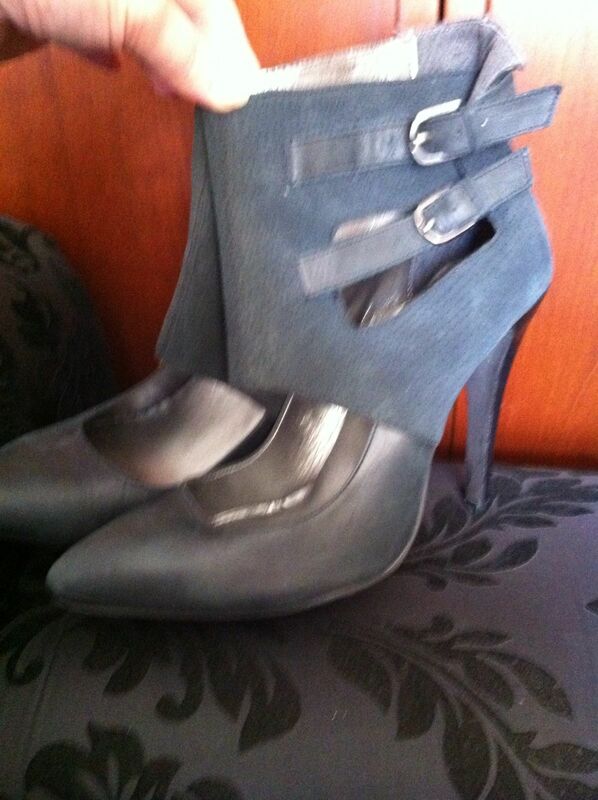 The other pair were green / blue also with a little platform but got out bid at the last moment. So in the end I bought the pair I had been watching on buy ib now for the last couple of weeks. I think I might put couple of photos onto my gallery just to show what I,m talking about. i am always puting heels on my watch list but don't always buy. Had a quick look in a charity shop this morning. Found a nice pair of JustFab strappy sandals in a size 8. Don't know why I didn't try them on. I think because I a size uk9 and I don't think they would fit any way. Think I might go back and try them on anyway. Had 5 items for sell on Ebay. Had to stop 1 listing as there was a problem with the listing. Sold I pair of Pleaser heels for £6. Hoping to get most of my money back. I paid about £20 for them but never wore them as were to small. I don't know if the difference in size had anything to do with the final price. Thought it better to list them as a size uk8 then a size uk9. There is no sizing on the shoes. Had 2 other items that didn't sell at £5 where I paid £20 after bidding on them. Sign of the times maybe? 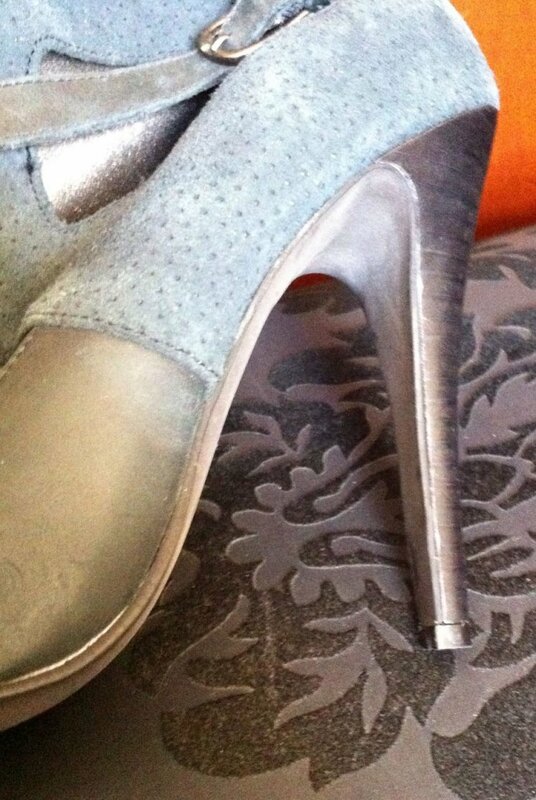 As for my Topshop heels I started the bidding at £15 but are as new, they didn't sell either. Going to have a rethink about Ebay now.Do I start returning shoes to sellers if the shoes don't fit? Postage costs seem to have an effect. Many commercial sellers do "free carriage" (that is built into the selling price of course), and I suspect many buyers now see that as the norm. It transpires that sellers don't have to charge VAT on something they give away, so there are tax and pricing advantages to offering "free" carriage to anyone who is VAT registered. I recently bought a new pair of Next high heels with generous size 8 for 99p but the seller charged around £5-60 for carriage that actually cost £2-80. I just looked at it being some shoes for £7. There was something wrong with the cut of them though, so straight to the charity shop, along with a new pair of size 7's from Primarmi that had developed a 'clicky' heel. I'm just about to put 4 or 5 pairs on, and nothing under £25. Hopefully there'll be people out there looking to treat themselves. Just tried to resell My next heels and no buyers. Not going to lower my start price from £5. Only charged £4 for postage. Costs £2.80 to post but still need to take packaging into account.. Might try free postage but will put the start price higher. I bought these new Next shoes for 99p. I had asked for the seller to not leave me any feedback, as I was in delicate negotiations over an expensive item (now sold). I REALLY wanted/want to leave some feedback over the carriage. Charged me £5-20 and only spent £2-80 at the Post Office. A rip off, but I did choose to buy. With people looking for discounted -new- bargains, "used" is getting a back seat. Even so, I had 3 or 4 pairs of new shoes on sale, and sold one. All high ticket prices, ranging from £35 to £45, which is quite high for me so I hadn't expected to sell them all. Oddly, I didn't sell the pair I had expect to go, as they had over 100 views and 16 watchers? You'd think someone would have bid? I pretty much charge the same, and explain how/why. RM charges me £3-90 for Second Class Signed For. I add the fees that will be taken from me when payment arrives, and bump that figure up to £4-50. I don't charge for packing, nor the trip to the P.O. although both cost me money. I'm aware that selling at auction is good for buyers, not so good for sellers, so I 'swallow' my losses to get a sale. Some bits haven't sold, no matter how many times I've tried to sell them. Not sure why .... Other than I don't tend to 'gift' stuff away. An interesting week. Sold a pair of very nice shoe boots I don't wear (the third of four pairs I bought 3 years ago), and a pair I thought I would never sell .... But I can't wear hem so why keep them? The shoe-boots were my first item to get listed at a fixed price. I didn't get the full price, but I got £10 more than I did for the other two pairs that I put into auction. The pair of courts I thought I'd never sell, were (i) too hard to walk in, and (ii) had a patent finish that would simply draw too much attention if I wore them out anywhere. It makes no difference to VAT or any other tax whether postage or other shipping cost is included or not in the selling price. If the seller is VAT-registered, it must charge VAT on both the item price and the shipping charge, i.e. whatever total amount is payable for the delivered item will include VAT. Although 'free shipping' may be attractive (even if it is simply an addition to the selling price), it often becomes excessive if two or more items are bought simultaneously and no allowance is made for the combined shipping. Likewise if separate shipping charges are quoted but are not discounted on multiple purchases (although many eBay sellers etc do discount). Many Amazon Marketplace deals are unattractive for this reason, e.g. a competitively priced item plus a reasonable (usually fixed) shipping charge becomes unattractive when two or more are bought and the full shipping charge is demanded on each of them. There is no difference to the buyer, but there is to the seller. Tesco/ASDA for example, can "claim back" VAT paid for the plastic carrier bags they give away at the checkout. (In reality they keep more of the VAT collected for the Revenue in till sales). We all know they aren't free, the cost is lost in any purchase made. Lets say I buy 1000 bags at £50, and pay £10 VAT on that. I sell some shoes at £30, ("gift" one bag) and £5 of that selling price is VAT I've collected for the Revenue. I don't buy or sell anything else that quarter, when I do my VAT returns. I get a £5 rebate from the Revenue, which cost me one 5p bag. Put into context, any VAT paid by the seller for carriage of the goods (they have sold to a customer) which is subsequently "gifted" (not charges for - no VAT collected), allows the seller to claim credit for the VAT paid in their carriage costs. It may not seem like much, but a company with 1000 postal customers a week, would doubtless see a noticeable difference in their bottom line. Which of course attracts a different kind of tax if their accountant was not doing his job very well. I can't remember the case study we did, but it revolved around a coffee company, someone like Starbucks. The study was to show the real cost to businesses of our VAT recording system. The story started at somewhere like the papermill. Who charged the printers for paper adding VAT. It then went to the cardboard company who folded and packed the printed card, who charged VAT. The packed cups then went to a wholesaler, who stored the cups, until they were sold to the fanchees. VAT was added again. At the coffee shop, there was no direct charge for the coffee cup. In fact if you went into a shop and asked for water, you were given a paper cup filler with water, for free. No VAT was collected for the cup as none was charged. BUT every other business that touched that cup had VAT records, and got fined for late submission or errors. I suppose the same VAT 'dodge' is also good for coffee shops? Sorry, Freddy, you are under a fallacious impression about VAT accounting. The simple rule is that, in a VAT-registered business and concerning anything bought or sold that is subject to VAT, it costs the business precisely nothing in terms of tax and there is no 'profit' either. Every VAT charge incurred on 'inputs' is recoverable from HMRC and every VAT charge on its 'outputs' (sales) is payable to HMRC. In practice, as you know, one is set against the other and the net amount for the relevant period is either paid over or recovered. It is perfectly possible for input tax to exceed output tax, if only temporarily, e.g. when a business starts up and buys lots of stock, plant, office equipment, stationery etc. (And someone selling zero-rated items such as books or most foodstuffs will be regularly in that situation, with VAT on its overheads recoverable but nothing to collect on sales.) Alternatively, a business selling standard-rated items may have little VAT to recover if it is selling from existing stock at minimal ongoing overhead cost. That might look like a temporary bonus, but don't forget that all VAT that one can recover is payable to the relevant suppliers sooner or later. In your example, you overlook the fact that the bags have to be paid for at some point. The business pays (ultimately) a net £50 for its bags, plus whatever the shoes cost (say £12 ex-VAT), and receives a net £20 for the shoes sold. If that is all that happens in a VAT period, then quite aside from the minimal profit of £7.95 (£20.00 - 12.00 - 5p), the business has a negative cashflow of £42, after VAT has been accounted for. The coffee shop has to account for all its VAT, including that incurred on giveaway cups, and is certainly not immune from making returns and possibly suffering penalties. The only one I know of, is a "free" bus pass. Everything else is worse. We'll have to agree to disagree on this VAT thing. I've tried to keep it simple, to show that the bags (free carriage) provide a VAT saving opportunity for some. It doesn't make anything cheaper to the consumer, but does provide advantages for the seller. The cashflow and bags (cost of sales) are not pertinent in my examples. I did like your two examples of food and new start-ups. I have challenged sellers in the past, once recently. First one was selling (I think) wiring heat shrink. If I remember, carriage was free and I wanted 3 different sizes, 3 different lengths. I asked about discount, bearing in mind there was only one lot of postage etc. The answer given was; "We pay pennies for envelopes, and postage is done on weight. More weight, more cost. 3 pieces sent together would cost the same as 3 sent individually." I suspect some of this is true, but not all. Anyway, I didn't get any discount. More recently I bought a Solid State Drive that came with free carriage. I put an extra item (£12) in the basket too, and up popped a carriage charge of £4-50 (or £4-99). I contacted the seller to ask why? They blamed the auction company software, but wouldn't remove the carriage charge by way of a basket discount. I removed the second item (cooler) and just bought the SSD. Hunting around the site I found the same cooler for £8-05 delivered. Delivery of the second item was slow, but it's still sitting here waiting to be used, so carriage was plenty fast enough! As with me paying £5-20 for carriage that cost the seller £2-80, we have a choice. Buy, or keep our money to spend elsewhere. In an ideal world, we'd get everything at the best price .... Sadly, we live in a far from ideal world. Just got 'ripped' for carriage again. Nope. Carriage reduced from £1-60 to £1-05. It's only 25p but why the extra at all? No sure about this VAT on free postage but I sort of understand the idea behind free postage now. These days there is nothing to gain by adding a postage charge while selling on Ebay. Seller's now get charged %10 on postage anyway. If I see a pair of heels I really want I,m going to try my best to win them. A high postage charge will not put me off. Only problem if when I receive them and they not what I expect or just don't fit or damaged then I,m going to have either return them or resale where I will lose money. I did complain to a seller about being charged £8 but she did refund me £4. Going to try to resale the two pairs that I had listed in the spring. Also going to slim down my collection even more in the new year. 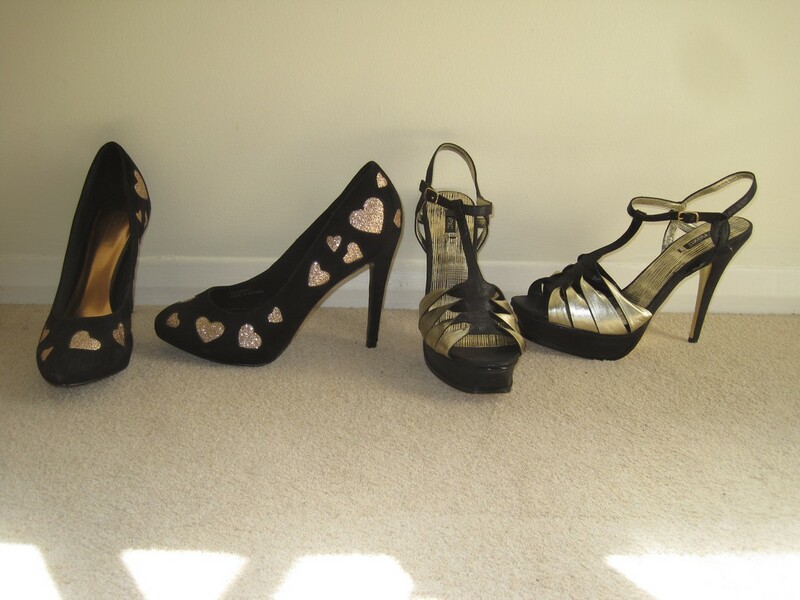 Two pairs I might as well throw away as the heels are damaged and don't wear them now. Hoping to win a pair of boots next week on Ebay. Postage only £4 Only thing is the listing ends at the wrong time for me. Going have to place a bid in 2 hours before hand. Well I won the boots. 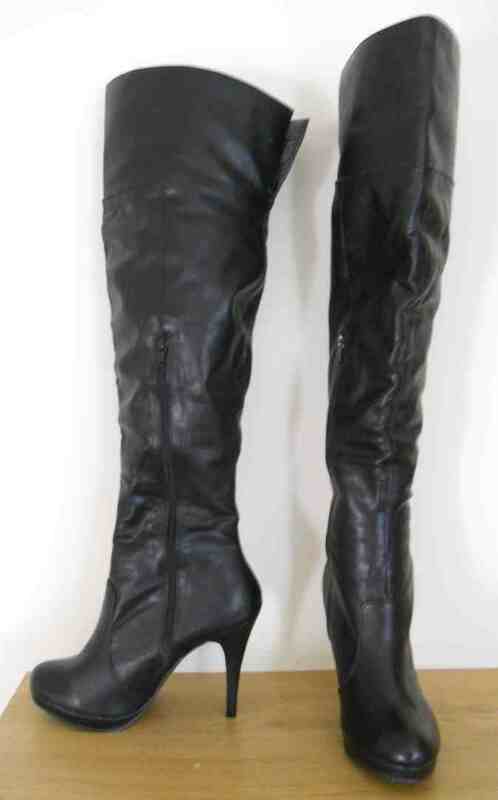 Over the knee boots from New Look. Got them today. Fit just fine. Bought another 4 pairs, 2 pairs in the real world and the other 2 on Ebay. I really do need to sell some pairs of heels. When I have more time I go into more detail. I haven't bought any shoes or boots from an auction site for some time now. There is a pair I've resisted for a couple of months. £40, but not leather, nor a PU version of leather either, meaning I would more easily get spotted wearing them. Have spent plenty on shoes and boots in shops though..... I'll be taking some back soon as I bought the same style of boots, cheaper in the crimbo sales. I too have decided to move on some of my excess. Probably the worst time of year to try though? "Sales" are on, and people are about to get their credit card bill and end-of-year utility bills.